When referring to Halong Bay tour Hanoi Vietnam, many people will think of Ha Long Bay, one of the 7 new natural wonders of the world. Though, this is not the only place that attracts travellers to this coastal city. Origin Vietnam Travel will like to introduce to you the Bai Tho Mountain - the "telescope" of the city by the bay. Bai Tho Mountain is an extremely famous mountain in Quang Ninh. Although the mountain is not too high but it brings about new experiences and beautiful sceneries. If this is your first time in Vietnam, here are some basic information you need to know about this poetic mountain. Bai Tho mountain is situated in the center of Ha Long City – one of the most famous Vietnam vacation spots. Bai Tho Mountain looks like a huge mansion with three majestic towers. The mountain is 106m high. It is a limestone mountain with half of the foot of the mountain jutting to the mainland. While the other half is soaked in sea water. In the past, Bai Tho Mountain was called Truyen Dang, meaning "the light". According to the old tale told by local people, that was in 1468, during his voyage to inspect the east, King Le Thanh Tong stopped here. Inspired by the magnificent beauty of the mountain, the King wrote a poem. And he carved it into the stone of the mountain. So the mountain was then named Bai Tho. About 300m from the shore, tourists can see the poem carved on a cliff in a square frame, each 1.5m in length. The best time to climb Bai Tho mountain is in the early morning. The road to the summit is quite challenging. But it is an attraction for those who love adventure. Follow a narrow staircase through the houses near the foot of the mountain. Visitors will certainly be overwhelmed by the magnificent scene, enchanted from above looking down. On the way, it would be interesting to see the goat eating the leafy branches growing on small patches of rock. Standing on the top of Bai Tho Mountain, right at the foot of the flagpole, visitors will be immersed in the immensity of heaven and earth. You can watch the blue water as the emerald green of Ha Long Bay. From above, visitors can enjoy the view of Ha Long City from four sides. In the west, there is Bai Chay with bustling tourist boat. The south is an immense sea that can not be seen by the horizon. To the east, the mountains lies there from millions of years ago. In the north, Ha Long City is like a big picture with hundreds of unique red roofs, highlighting the blue sky and bright green coal mine. At the foot of Bai Tho mountain is the blue sea and busy fishing village. Another special thing about Bai Tho mountain in the Halong Bay tour Hanoi Vietnam is exploring secret caves. The caves remain traces of communication activities of cadres and workers of Quang Ninh post office. This work is to exchange accurate information between the province and central organizations during the war with North America empire. There was the main center of the post office in Quang Ninh province with many old stuffs hidden in the caves. Today, visitors will easily recognize the relics. It is thanks to the moss wall, stained color, signboards and the stairs leading into the caves. 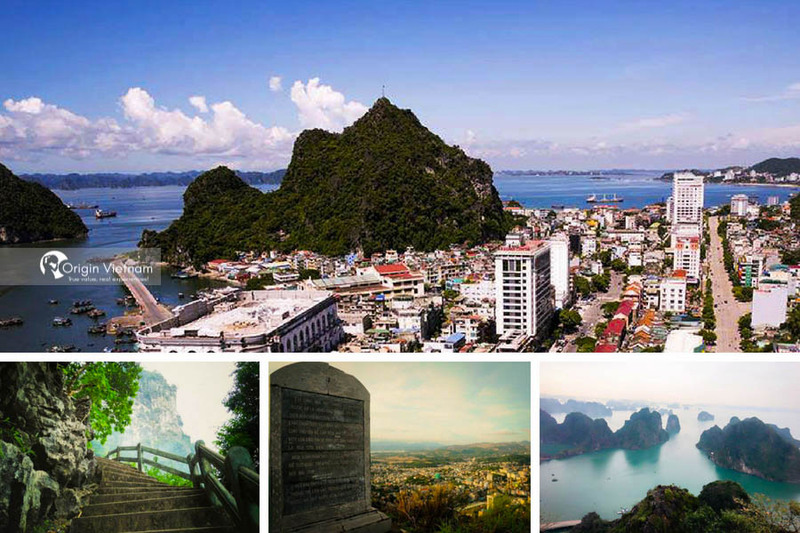 So far, the remainings of the communication activities of the coastal people of Halong during the war have all become valuable cultural and historical monuments. Bai Tho Mountain is considered as a sign of communication in the life of people living in the sea. But it is also an evidence of people working for the cause of protecting the country from invaders. When you visit Halong Bay, it is wonderful to view the romantic scene from the top of Bai Tho Mountain. And of course welcome the radiant sunlight and fresh atmosphere from the height of 106m above sea level. There is nothing greater than picking up your backpack to travel to Vietnam to get the whole view of Halong from the top of Bai Tho mountain. If this has sparkled your interest please contact Origin Travel for more information about Bai Tho mountain.